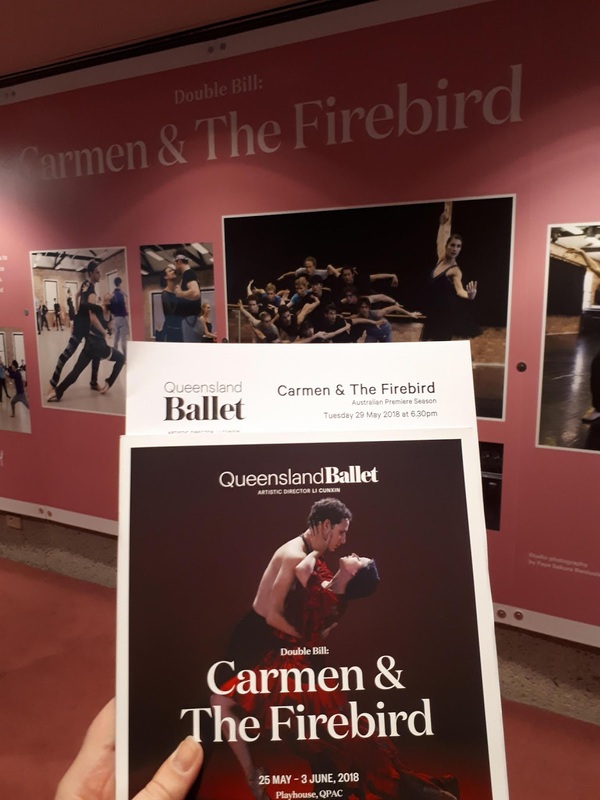 Queensland Ballet present their much-anticipated double bill of Carlos Acosta’s contemporary Carmen and Liam Scarlett’s dark and thrilling The Firebird. The two works were expected to be disparate, but unfortunately this comparison could also be made in quality as well as thematic and balletic concepts. The Firebirdtells the fantastical tale of a Prince (Joel Woellner) who stumbles into an enchanted garden ruled by the immortal Koschei (Rian Thompson) and watched over with the Firebird (Laura Hidalgo), who taunts and competes with Koschei in her equal magical power. The Prince becomes enamoured of a beautiful princess, one of Koschei’s many captives in the garden, and with the help of the Firebird they destroy his magic and free themselves. Queensland Symphony Orchestra performed Stravinsky’s iconic score, arranged by Jonathan McPhee, beautifully. The towering, mobile sets and striking costumes were designed by Jon Bausor and lighting design by James Farncombe drew the audience into the dark and mysterious events unfolding onstage. Laura Hidalgo was, unsurprisingly, the standout performance as the seductive, seemingly weightless Firebird, finishing her sharp, quick movements to their fullest extent and always appearing in control when she was onstage, minus a slight slip in a pirouette which was quickly recovered from. Mia Heathcote was equally lovely as the Princess with her deep backbends, soft arms, and long extensions, as well as her characteristically strong stage presence and personality. Rian Thompson’s allegro as the villainous Koschei was imposing, and he had excellent chemistry with Hidalgo’s Firebird as they performed the complicated, lift-heavy choreography. The corps’ synchronicity was not as tight as it could have been, and in one instance of floorwork some of Koschei’s minions had bent legs while others’ had straight. The choreography incorporated a lot of sharp movements on the beat and moments of near-silence, creating the suspenseful atmosphere of the enchanted garden. In the final fight, particularly, the music and movement rose together to a frenzied crescendo before the Firebird cast her spell. The joyful reunion of the lovers, golden light, falling leaves, and beautifully executed final solo left the audience in awed silence before bursting into rapturous applause. Carlos Acosta’s Carmen does not hit the mark as squarely as The Firebird and, if anything, looks weaker by comparison. Pared back to a one-hour, one-act performance, Carmen tells the tale of the titular fiery seductress and the violence of a scorned man. The choreography was crafted to draw the eye to certain areas of action on the stage, which was great, but often lacked nuance. Several images in the work were also unclear – a serious drawback in a nonverbal storytelling medium. The bull can be assumed to be fate or death, but Carmen dances with him at one point. Is it a dream, a vision? The use of imagery that could have been very powerful – the bull, the single red rose – felt underdeveloped. The frequent removal of clothing also felt seedy, and made the audience uncomfortable. Sets and costumes designed by Tim Hatley were simple and effective, although the red bullfighting circle seemed to be slippery beneath the dancers’ feet and there was an issue in separating the jail cell bars to move them offstage. Bizet’s score was arranged and orchestrated by Martin Yates and performed with pizazz by Queensland Symphony Orchestra, excepting a microphone glitch or bump about halfway through. Lighting design by Peter Mumford complemented the creation of the different locations, from behind bars to the bullfighting ring. Yanela Piñera was somewhat rigid and balletic in the role of sultry Carmen, going through the motions of the iconic temptress. She seemed to ease into the fire and carnality of the role as the work progressed, but her chemistry with both Don José (Victor Estevez) and Escamillo (Alexander Idaszak) felt pale as they executed the choreography, although when the work called for acting they seemed more at ease with one another. Estevez gave an emotional performance and his allegro work was strong in his role as spurned lover Don José, and Idaszak was in constant motion as the charming bullfighter Escamillo. The figure of the bull (Vito Bernasconi), silhouetted against a blood-red sun, loomed over each new scene and there was some interesting use of props, especially the way in which Carmen danced with her chains and Don José. The choreography for the corps was an interesting fusion of modern and Latin dance, performed in heels rather than pointe shoes. Despite messy landings on some of the more difficult acrobatics and a lack of synchronicity in the bullfight choreography, this was the highlight of Carmen for me, particularly the dancing on and around the tables. The potential of this work is clearly visible, but the choreography does not realise it – the incorporation of modern dance, particularly, was a strength but ultimately the imagery at play was unclear and some quintessential sexual energy was missing, particularly from Carmen herself. The Queensland Ballet dancers did an admirable job but at the end of the day the deficiency was in the core creation of the work, not its execution. Overall, the two works are vastly different in nature but, presented in a double bill as they are, it is impossible not to draw comparisons and Firebirddefinitely emerges triumphant while Carmenis left behind.